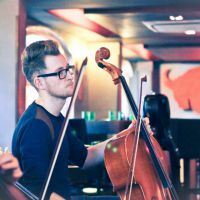 Additional Info: Samuel Rowe is an established creative session cellist based in London and Brighton. He has made his name working alongside numerous independent artists and has extensive arranging experience that spans the sonic landscape of pop, rock and folk to jazz and film soundtracks. His love for collaboration has brought him to play at the likes of Abbey Road Studios, The Barbican, St. Pancras Old Church, BBC Scotland, and The Southbank Centre's Queen Elizabeth Hall to name a few. He first discovered his passion for arranging in Neighbourhood Studios (home to UK band 'Athlete'), sowing the seeds of his craft at the prestigious BRIT School, then growing roots at Goldsmiths University Of London, where he honed his skills in orchestration, arrangement and composition. Currently Samuel is co-founder of 'Integra Strings' quartet and works alongside a community of string players and continues to be saught after as one of the leading string arrangers for fresh new music in London and Brighton.